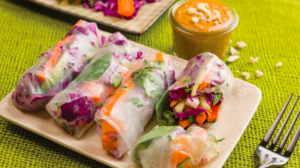 Blog — You have to try these Spring Rolls! I love cooking with essential oils, they give your food such a delicious flavor! I found this recipe in my doTERRA Blog book and it was too good not to share! Combine all ingredients, except for wrappers and water in large mixing bowl and stir well.